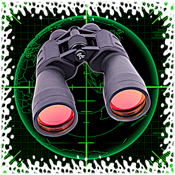 The most impressive Night Vision application on the market! ★ Get rid of the danger that the darkness hides! ★ Do not be vulnerable to something you cannot see! ★ Arm yourself with the latest perfect weapon that will protect you from uncertainties and tides of darkness! 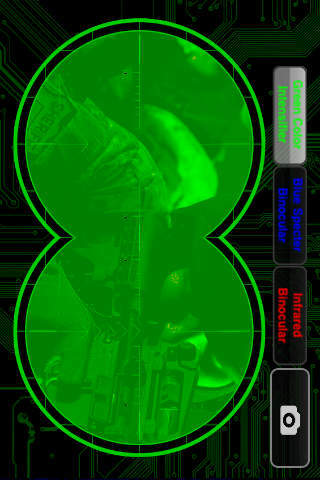 Make your iPhone/iPod to work in the dark like if you were wearing night vision glasses, it’s easy. ATN, Lens, binoculars : you’re all set, turning your iPhone into a spy gadget. Easy to use, you can even take pictures with it and look the result right after in the album. ✔ A 100% visibility in conditions of absolute darkness! If you have a problem with the application, please, restart your iPhone. Also, please make sure you have enough free space for the photos to save.